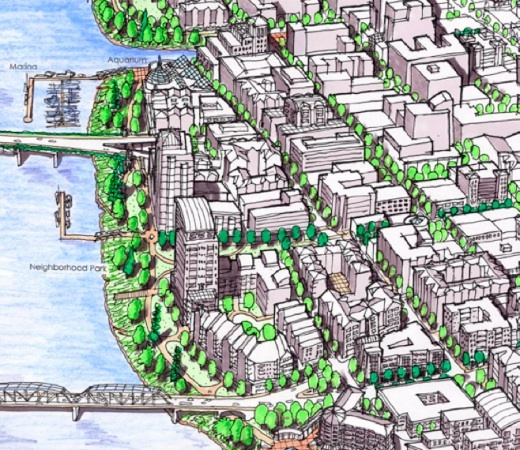 This drawing from 2001 by Riverfront for People shows what the central eastside (just south of Hawthorne Bridge) could look like without I-5 running through it. 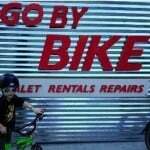 A report by The Oregonian today says Mayor Adams is shopping this idea around. “An expensive idea that first gained traction in Portland in the 1980s, flared again in the 1990s and resurfaced in the 2000s could rise again in some fashion under Mayor Sam Adams, who has nine months left in his term. 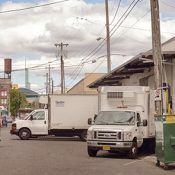 But city officials are so far keeping mum about the recent $11,000 study that shows a rejiggered Interstate 5 near Portland’s Central Eastside Industrial District, declining this week to release “a draft concept-level diagram” of the interstate to The Oregonian. As Slovic mentions, this is far from a crazy new idea from Mayor Adams. 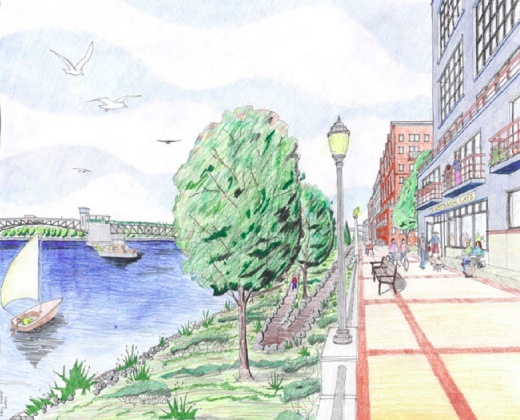 As I shared back in 2006, a group of smart and connected citizen activists dubbed Riverfront For People — the same folks that got ODOT to remove Harbor Drive and replace it with Waterfront Park — have been pushing for this for over a decade. Buel also emphasized how this plan would cut congestion and reduce car trips in Portland. The plan calls for adding capacity to the freeway and — because many people that drive in Portland are commuting from outlying cities — a major part of their vision is to add thousands of close-in, “workforce” housing units enabling more people to walk and bike to work. Obviously this project is technically feasible and the benefits to our city hardly need explaining. I bet we could even find the money for it somewhere (think I’m crazy? Some people think we can find money for the CRC and did you know we’re building a new light rail bridge and line to Milwaukie!?). But as we all know, the conversation — if it actually picks up again at all — will be more driven by politics. It might be instructive to recall the unfortunate demise of the Sauvie Island Bridge Relocation Project. This project, a.k.a. the Flanders Street Bridge, would have recycled the old Sauvie Island bridge and put it over I-405 through downtown Portland at NW Flanders St. 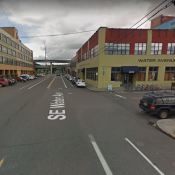 The construction crews said it would work, Mayor Adams and PBOT were pushing for it with full force (and even Commissioner Saltzman approved) and neighborhood groups and transportation activists were rallying for it. But in the end, the project fell victim to politics. Adams, who was in a re-election battle with Sho Dozono, got cold feet and pulled the plug. Dozono, who hailed from east Portland, used the all-powerful equity argument to politicize the project and he ultimately claimed victory once it was dead. I’m not trying to dampen hopes that Adams might succeed resurrecting the plan to bury I-5, I’m just trying to add some context to the battle that he’d face. It’s worth noting that the Mayor has just nine months left in his term. 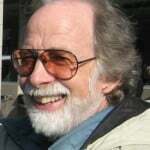 Adams has staked his reputation on sustainability and transportation and it must be obvious to him that there could not be a more bold and lasting legacy for him to leave than getting rid of a huge eyesore that moves only motor vehicles and spews benzene and exhaust into our river and into the lungs of our city. I’ve got a contact into the Mayor’s office for a statement. Stay tuned for any developments. 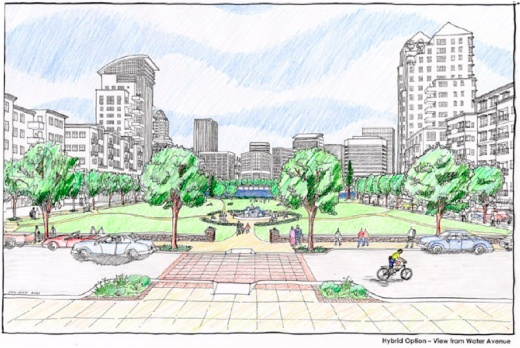 UPDATE, 3:32 pm: Mayor Adams has just released a concept plan. Check it out. Of course I love the idea, but the big problem with those conceptual drawings is that all the businesses currently in the Central Eastside District look like they’ve been replaced by condos. Can’t we imagine something other than yuppie dorms when we envision the future of urban development? Isn’t dense housing kind of a key component of sustainable living though? They don’t have to be condos. Just look at the projects that are going in on the east side now. Completely privately funded, low-car living, apartments. Rents are lower because car parking spaces are not needed. This is exactly what I would like to see in place of I-5 on the east side. As gas prices continue to go up, these types of apartments will be in high demand. Awesome. It’s lofty, but would be the next mt hood freeway / waterfront park. My former city, Duluth, has this and it works splendidly. One is able to walk or ride right from the commercial district out to the lakefront path without obstruction. It’s great. I think you nailed the big problem, though. Forget tunneling — as others have pointed out (for years), the more sensible and affordable approach would be to remove that stretch of freeway and make 405 the new 5. Yes, 405 might need to have a lane added in each direction, which will be a challenge, but with declining VMT per capita and the increasing push for congestion tolling or a VMT tax, the whole thing might be more do-able than it initially looks. The amount of land that would be opened up on the east bank, and on the west side where the Marquam ramps are, is staggering. This would also add weight to the idea of bringing the Hawthorne and Morrison viaducts down to the ground just after the train tracks. The CEID sanctuary would need to be preserved and strengthened, of course. I particularly love the Riverfront For People vision of leaving a chunk of the Marquam as a sort of “memorial to the age of freeways”. Let’s take the CRC money (oh wait, there is no money!) and do this instead, like back in the 70’s when the Mt Hood freeway plan was transformed into the first MAX line. It’s time Portland did something visionary and gutsy again. And the river should be the central boulevard of the city. Totally agree. 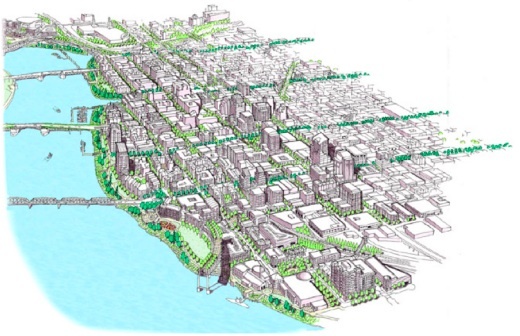 Maybe even add a lane to I-405 if we can reclaim the river on the eastside. I-5 through the eastside is mess anyway. So where would I5 head underground and where would it come out again? Would it go under on the west side of the Willamette and then come up again some place near Delta Park? This seems like it could be similar to Boston’s “Big Dig” project a few years ago. I imagine the cost of this type of project would be staggering. Also how would burying the highway help cut down on benzene and exhaust fumes? They would still need to go somewhere. All in all an interesting idea. That was my thought. As someone who grew up an hour north of the big dig (and watched it drag on painfully for 20+ years) I question the ability to accurately price out a project like this both in time and money. The end result could be fantastic, but I can’t conceptualize Adams having the clout to get a project like this put together in the 9 months he has left. I’d say the project to bury 99 in Seattle is more analogous than the Big Dig. I love this idea. I love the thought of just tearing up the entire Oregon portion of I-5, though, so my opinion may be somewhat skewed. I think it’s interesting that Vera is being called in – probably to tell Sam what to avoid, as she didn’t get too far with her “let’s cap I-405 through downtown” idea. Interesting, but would there still be exits to OMSI, Lloyd Center, Belmont, etc.? And how costly would it be to tunnel underneath the Willamette? Is Boston a good example? It took decades to complete the big dig, and during that time period getting in and out of the city was a disaster. It was a bazillion dollars over budget, and the quality of the work is being questioned. I would think Boston would be an example of how not to do it. The Big Dig? 20 years and $20 Billion dollars, pass please. I don’t see where the funding would even start here. I don’t think it’s a very good idea personally. It would make the CRC look like a well choreographed ballet. I will be dead before it’s completion, and I am preparing my children to seek living outside the U.S. as soon as they can. Good Luck P-Town. Maybe in 20 years the need or use of the interstate system will be marginal anyway. I will be dead like I said, so who cares. I-5 doesn’t have to be put in a tunnel. One variation of the plan adds a lane in each direction on 405, and just gets rid of the section of freeway along the river between 26 and 84, including the much-maligned Marquam bridge. This would be much cheaper than retrofitting the bridge and the freeway viaducts to withstand future earthquakes. Tunneling a new freeway would be expensive, though it is feasible – Washington State is planning to do this exact thing to replace the Alaskan Way viaduct on highway 99, along the downtown Seattle waterfront. New tolls on the highway are supposed to pay for most of the cost. The whole thing would be bored by a TBM, like those used for the big sewer projects, or to build new subways. I would love to see this happen. Have to agree with peejay that we should think about how to preserve the current light industrial jobs/businesses there, though. Sadly, I don’t think Mr. Adams has the political capital to get this rolling before he’s out of office. Put some zip lines off the bridge stub and you’re golden. I like the idea of dropping one half of the I-5/405 loop, and then we should ALSO cover I-405. That would be awesome! Add lanes to I-405 through Portland, and cap it. This now becomes I-5. 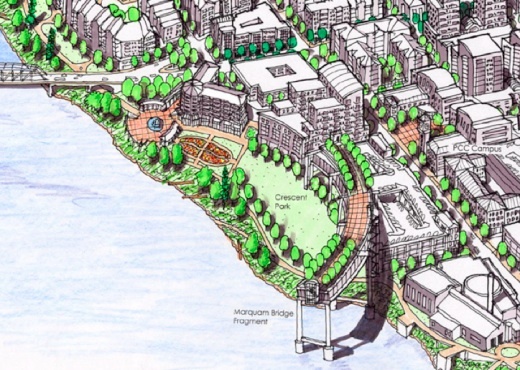 Remove the Marquam bridge and the east bank freeway up to the I-84 interchange. I-5 through the Rose Quarter becomes an extension of I-84 and does not need expansion; 2 lanes each direction is enough. We would also want a one lane each-way connector to the Morrison bridge from the existing I-84/I-5 interchange. This won’t take up much room. So for much less than a Portland Big Dig to bury I-5, we can make all of central downtown and the east bank freeway-free, and prepare our city for a healthy, low-car future. Heck, let’s take the money we are planning on dumping into the CRC and put it into this project instead. Seriously! I’m not against spending money but I want it to be spent in a way that improves people’s lives. What can we all do to help this become a reality? That would be amazing. Never understood why we needed that portion of I-5 AND I-405. It’s true that in Europe, entire freeways are buried where they go through cities. There are some that have entire shopping malls built on top of them. My main beef with this portion of I-5 is that it really, really breaks up the connectivity of the neighborhood, and thus access to the waterfront. Plus, it’s noisy, polluting, ugly. Let’s put it this way. 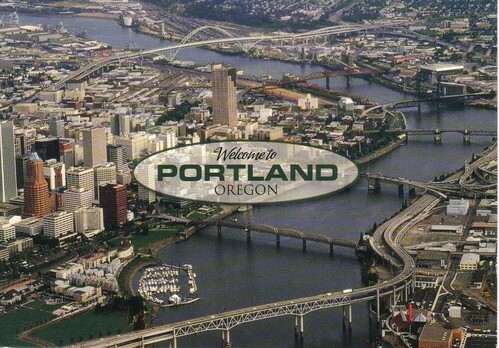 You would hardly take a photo of it, and stick it on a postcard with “Greetings from Portland” on it. What a beautiful prospect! And to help with equity issues, including mitigating some of the gentrification that has been taking place in Portland, the City should zone a good percentage of what will be both new and revitalized acreage to lower income housing and small business. There would still be plenty of profit (and tax base) opportunities in the area, and of course the freeway users would still have their lanes underground – or even add another one if that is what it takes to make it politically palatable, the livability benefits in the long term would outweigh the new lane congestion. How does this stop vehicles from spewing benzene and exhaust? They will still be there, just under ground. From what I’ve heard, the tunnel would help filter the emissions a bit… But you’re right. Point taken. Some of the worst levels in any city our size. So I have been told. Deep-bore tunnels have large air handling systems. You would just have to hope that they don’t place the vents near you. Keep in mind that the drawings here are over 10 years old. The city isn’t releasing materials about what they’re investigating this time. I don’t know if the market can bear many more Pearl/South Waterfront-type developments. I sure like the idea of burying both I-5 (and I-405), but I don’t see how we’re going to have the money to do it in the foreseeable future. Seems about as likely to happen as Vera Katz’ attempted legacy project of burying 405. Tunneling is insanely expensive, and NEVER comes in on time or under budget — witness our own Big Pipe and Westside MAX projects. Both very worthy, but also very costly. Here’s a (very long) good read on the history of the controversy and building of the sunken freeway through Duluth. Thanks for the link. I have family in Duluth and visit there annually. I remember much of this stuff being built, but I wasn’t fully aware of the scale and scope of the project (e.g., railyard relocation, trout reef creation). The end result sure is fantastic, especially the lakewalk — and, frankly, extending the freeway past downtown has had the effect of reducing through-traffic there, and making it more human-friendly IMO. It certainly has made the place much more tourist-friendly and brought in plenty of tourist dollars, too. But it did cost $200M. In late 80s/early 90s dollars. Another subsidy for the car people. A huge bill to counteract the unsustainable behavior. Geez people, this is strictly a ‘visioning’ exercise. It’s not like it’s planned or going to be planned or is in any way in the books or commited to in any way. Slovic’s article is yet again a big serving of the tripe I’ve come to expect from her (and the Oregonian). They can’t put anything in it’s proper context. At this rate government won’t even be able to ponder the the future out of fear of offending some special interest or being accused of wasting money. I was thinking the same thing. It sure is a pretty neat idea though. Kind of like trying to take a train anywhere in this country other than major cities. One can dream. It would be interesting to learn more about how this could be funded. One thought: how much is the land taken up by the freeway worth? Funding for projects like this on the Interstate highway system is highly dependent on the feds. And with the current economy and the Repubs penchant for de-funding government at all levels…don’t hold your breath. There is probably a good chance of the CRC falling victim to that, never mind the local debate over it’s merits. A project like this could easily take another 20 years to get off the ground…and that’s under the best of circumstances, not a condition we have today. Anyone have historical photos from the I-84 to Marquam area? I can say that because I followed the project very closely and it’s true. The fact is that it wasn’t a budget problem, nor was it a “stupid” project. It had broad support from many corners.. both public and private. 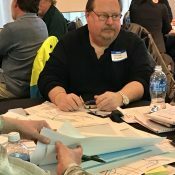 It was also paid for (funding sources for most of the $5 million price had been found)… except for a $500,000 chunk that would have been raised privately by local businesses who knew that having a bike/walk only bridge on Flanders would be a boon to their businesses and neighborhood. It was only $5 million which is a drop in the bucket for what it was worth and for the unique opportunity it presented for us. IMO, it’s one of the biggest disappointments of Sam Adams’ tenure. I believe he simply folded under the pressure of the campaign and the haters who didn’t want to see it happen. A real bummer. And it adds insult to injury that after trying to convince everyone that the reason we needed the Flanders bridge was because Everett and Glisan are very dangerous, Adams never went back and improved those crossings after Flanders fell through… therefore essentially admitting that the only nearby east-west crossings of I-405 are very dangerous. First of all, it was estimated at 5.5 million. That was the initial contractor’s estimate. If you think that estimate was accurate, then you don’t know much about the engineering and construction business. Regardless, saying that 5 or 5.5 million dollars is “a drop in the bucket” for an unquantifiable benefit you’ve called a “unique opportunity” makes no sense at all. We need numbers here and I don’t think you have any. Also, do you have any documentation that the project was almost completely paid for? I knew some people involved in the analysis and I hadn’t heard that any of this funding was concrete. I wonder if transportation advocates will ever be able to develop a useful conversation to counter, as you say Jonathan, “the all-powerful equity argument” or if it will just be something that people use to their advantage whenever it suits them. Take the CRC money and put it into this pie in the sky idea (hole in the ground), that perpetuates the myth that the car is the future? First off what CRC money? Build more Condos? We’ve got the Pearl and South Water Front having condo fire sales, yea we need some more subsidized condos, that don’t pay for themselves. Can’t wait to start digging that 1-2 billion dollar tunnel to subsidize cars then put some subsidized housing on top of it. Where’s my camera? The biggest advantage would be noise. 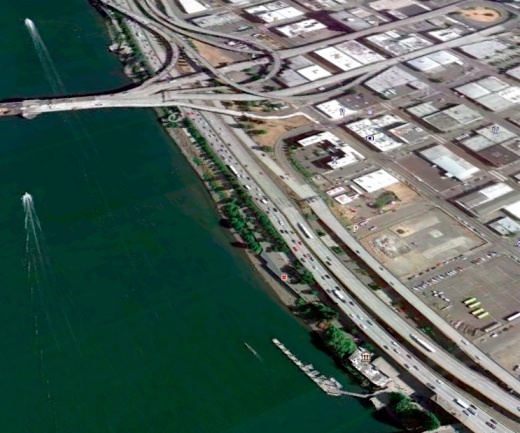 I-5 and 84 make massive amounts of noise on the waterfront. I recommend anyone interested in how much noise to visit (safely, with a friend) the waterfront at 2-4 in the morning and see what a difference it makes. Endorse this idea, wholly. I fall asleep to the sound of i-5 if my windows are open and pretend it’s the sound of the ocean… Ineffectively. Look what Mayor Adams just released. This is nothing short of habitat destruction! Where would all of the asphalt & concrete live? This looks horrifically expensive. Couldn’t we get more for our dollars by filling potholes, paving Portland’s miles of gravel roads, building sidewalks, or making current greenways less bone-rattling? Fell victim to politics… Love that. What does that really mean? Advocates for a prohibitively expensive project lost the argument. Let’s hope it ends that way, again. definately not. Getting rid of the Eastbank freeway (removal or tunnel) frees up some very, very valuable land for productive use, creating jobs, close-in housing, a entire new city, etc. Paving streets and building side walks need to be done and paid for by the residents who benefit via LIDs. Great cities do not run freeways along their rivers. What does Frankfurt am Main have across the Main River from its downtown? A string of museums and greenspaces. 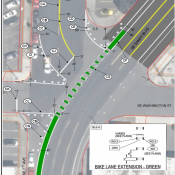 Its about time Portland fixed this horrendous mistake from the 60’s. And you drive on which roads? The street you live on is not the only part of the transportation system that benefits you, as I’m fairly certain you travel beyond your own block and use roads on which you, personally, do not live. Paving and other improvements on local roads would benefit everybody by reducing particulate pollution, improving the quality of stormwater runoff, reducing the wear and tear on cars that are simply passing through the area, improving access for emergency vehicles, and allowing disabled folks greater mobility. LIDs on a per-block basis are prohibitively expensive; trust me, we’ve checked. That’s why you don’t see a lot of neighborhoods banding together to form them. A city-wide project could be sent out for bid, and the cost reduced on a per-home basis. It is a pity and an embarrassment that some people in this city still live on streets in such condition. If I’m not mistaken, Portland has a glut of overpriced, unsold condos already waiting to be purchased. Even if there were demand for such units, they can’t be sold until after this whole project has been financed, conceived, designed, and built. The sizeable park will also take money to build, money to maintain. Neither the city, nor any other potentially contributing government agency, is flush with cash right now. If the money were there for more basic services, like the ones I’ve listed, plus a surplus, I think this bury-I5 concept would be a splendid idea. The Metro area has an even bigger glut of overpriced suburban housing, but you don’t see that preventing people from building new houses. Actually, I do. I work with contractors, and new suburban development has plummeted along with the demand for many homes that are currently standing vacant. Plus, I think there’s a difference between private individuals taking a risk with their own money building extra housing for which there is currently little demand, and elected officials spending millions (or perhaps billions) in tax dollars on a project that’s based on the idea that there’s a booming market for these condos when, currently, there isn’t. no raze all current I-5 from South I-205 (Sherwood) to North I-205 (N. Vancouver. Turn I-205 into new I-5. i actually like the marquam bridge. its brutal simplicity can actually be quite beautiful. also it is historically significant as it was the first bridge designed with CAD (computer aided drafting/design). I agree about the aesthetics, and it would also be a shame to take away a bridge that isn’t on the verge of collapsing into the river. But it could be used for something other than a freeway, for sure. Still seems like the best idea in terms of traffic flow would be to get rid of the Marquam Bridge and all ramps south of 84, north of Naito on 5, renumber 405 as 5, and renumber the Eastside Freeway as US30 (to avoid renumbering all exits on 84).